Cinco de Mayo is coming up, and we’re just about set to celebrate with Mexican flags flying, ladies dancing with skirts a-whirl, and the folk music of our neighbors South of the Border. While we enjoy Tamales, so spicy they will blow off the top of your head before you can gulp down a chilled glass of Horchata to ease the flames tracing their way through your digestive tract, let’s pay homage to the musician of the mesa; a wondrous player of the guitar, the bass, and the concertina. I am speaking, of course, about the mighty Mariachi. He wanders from town to town with guitar in hand, and a sombrero on his head to ward off the intensity of the midday sun. He is the minstrel who sings his tales – everything from the colors of the sky, on up to the Ballad of Heisenberg in Breaking Bad. Of course, he is decked out in a richly embroidered suit, once reserved for the horsemen of the desert. The Charro suit is a traditional garment that has endured for decades. This suit consists of long pants, short jacket, vest, shirt and bolo style tie. 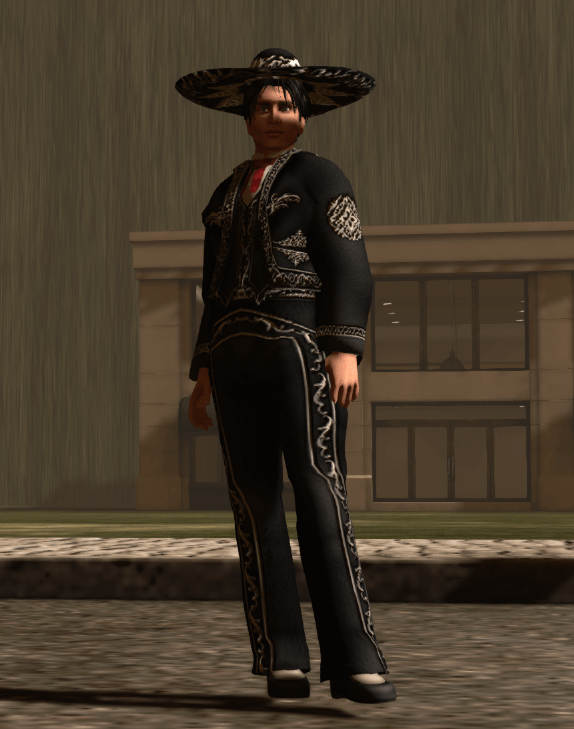 The whole ensemble is topped with a matching sombrero, and fastidiously embroidered.